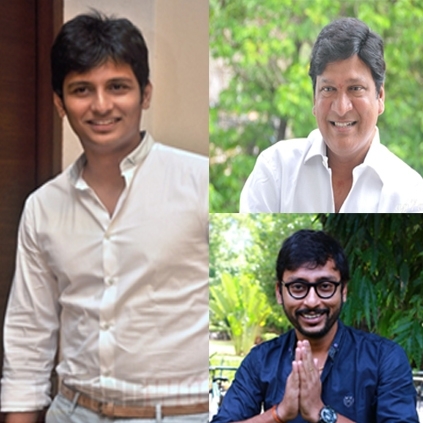 A VETERAN ACTOR TO MAKE A COMEBACK AFTER A LONG TIME FOR JIIVA AND RJ BALAJI? Jiiva, whose upcoming next three films, Thirunaal, Sangili Bungili Kadhava Thora, and Kavalai Vendam are in different stages of production, has reportedly signed his next. If sources are to be believed, his next film in the pipeline is said to be titled as Kee, which is stated to be directed by debutant Kaleesh, an associate of director Selvaraghavan. This film is said to deal with electronic gadgets and latest technologies and apparently will be a fun romantic comedy. It is also said that veteran Telugu actor Rajendra Prasad will be seen in a prominent role in the film, as Jiiva's father. Rajendra Prasad has done notable films in Tamil, like Nandu and looks like he might be making a come back to Tamil films after a very long time. Anushka to complete one before Thala 57? Jiiva’s Upcoming Venture, Gemini Ganesan Schedule To Begin From 21st March In Chennai. Jiiva Might Do A Film For Global Infotainment. Jiiva's 'Kavalai Vendam' Team Starts Shooting Today, 18th January. Jiiva's Thirunaal Might Release On February 12th. Jiiva's Kavalai Vendam Team To Start Shooting From January 18th 2016. People looking for online information on Jiiva, Nikki Galrani, RJ Balaji will find this news story useful.